Changes to a major commuter route will kill off business and worsen rat runs, say residents and business-owners. Bristol City Council is proposing a 24-hour bus lane and several turning restrictions along the A4018, which links north Bristol to the city centre. More than 2,500 people have signed a petition protesting at the move. The council says it is needed to ease congestion and cater for a housing development at the former Filton Airfield. The plans will see only buses, bikes and taxis permitted down the High Street in Westbury-on-Trym centre. Existing one-way streets would be reversed and ten junctions along the three-mile main road to and from Cribbs Causeway blocked. Amanda George, chairwoman of the Westbury-on-Trym Business Association, said: "Many residents feel this is going to kill the village, as well as the Stoke Lane businesses. "We have funeral directors and Mogford Prescott which has been here for more than 100 years concerned about delivery vehicles and how they will get to their businesses. "My main bugbear is the council has not distributed enough leaflets and we're not even sure if all businesses in Henbury, Brentry and Westbury are aware of the proposals." "Those who do use the village won't be able to access parking and will be put off from visiting entirely." Bristol North West MP Darren Jones has launched a petition protesting at the "carving-up" of the village. Three hundred people attended a meeting about the plans on Sunday. He said: "We think the council do need to go back to the drawing board but I have had assurances from the mayor, Marvin Rees, that this is a transparent consultation process." 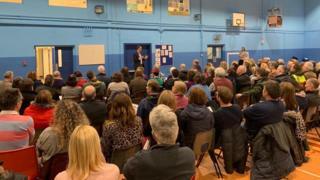 A Bristol City Council spokesman said: "We launched this consultation with the specific aim of gathering views from the local community and the wider Bristol public about our proposed changes to the A4018. "The aim is to keep traffic flowing and improve public transport reliability. "At this stage no decisions have been made, and we will take the comments and views from the consultation into account when considering final proposals." The online consultation is open until 10 March.